The elegance of Skogafoss has to be seen to be appreciated. It’s one of Iceland’s tallest waterfalls, and tumbles off cliffs that used to mark Iceland’s coastline. Thanks to a combination of factors leading to land growth and land rise, the coastline grew outwards by about 5km, and continues to grow today. Melting glaciers reduced the weight on Iceland’s landmass allowing areas which were just below sea level to rise, whereas tectonic activity, volcanic eruptions and river sedimentation led to further land growth. 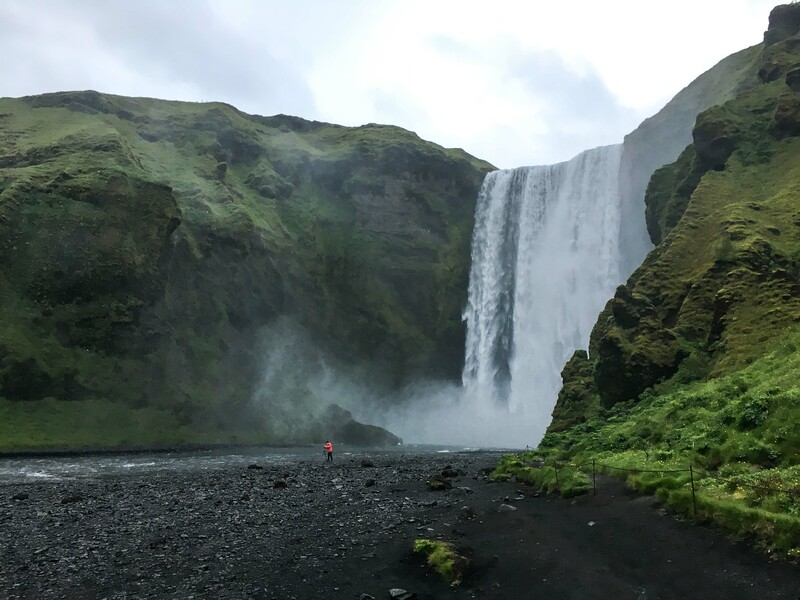 The expanded coastline means that you can walk right up to the base of Skogafoss, and it is very easily accessible. Walking up the adjacent staircase to the top of Skogafoss is slightly harder! I slept right by the base of the waterfall in a lovely hotel, here.